The model Opel Ascona was a large family vehicle designed by the German automobile manufacturer Opel (General Motors) from 1970 to 1988. It had three generations, beginning as a rear-wheel-drive, and ending up as a front-wheel drive car. The model was sold more than 3.9 millions times becoming one of the best sellers for Opel. 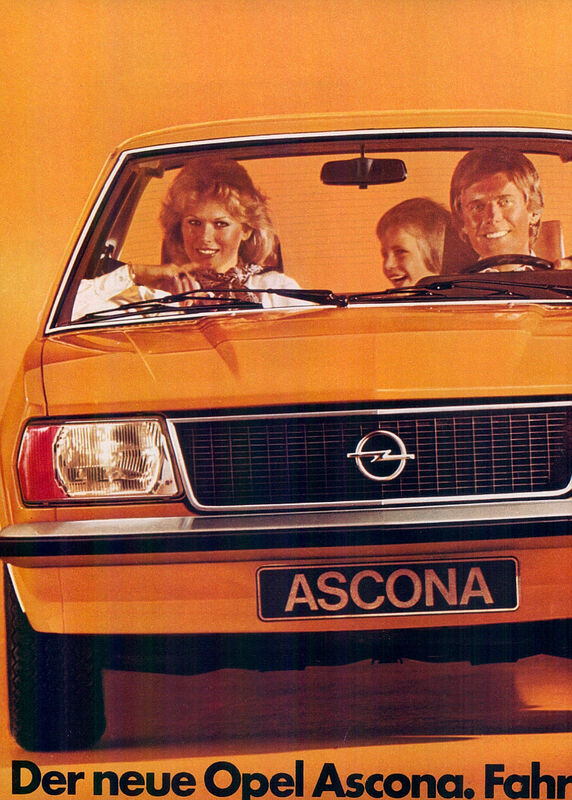 Opel Ascona took its name from the lakeside resort of the Canton Ticino in Switzerland. As a matter of fact, a special edition of Opel Rekord P1 was already sold in the 1950s under the brand name Ascona. Situated in Biel by Bern, the General Motors Suisse car factory decided at the end of 1960s to rebrand this historical name. Should IH pay attention to cars? We think yes because Opel Ascona was closely related to the Insubrica region. IH has thus researched some interesting facts on this long gone brand. As said before, a special model of "Opel Rekord P1" was produced in ten exemplars in the 1950's and was equipped with a 1.5-liter engine with 55 HP and a three-stage two-colour with white roof, equipped with two-tone interior and leather upholstery, as well as with a chrome trim at 45 ° angle front fender that separated both shades below the waistline and an "Ascona" logo on the rear side panels. Opel reached a conclusion in 1968 to reuse the brand name of Ascona for an adapted version of the Opel Kadett B into which the manufacturers had added a 1.7-litre engine, borrowed from a larger Opel Rekord model of that time. 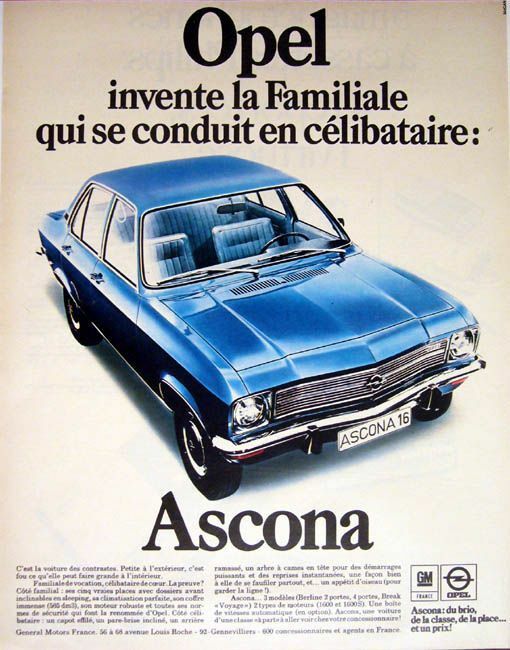 Opel Ascona A was launched in September 1970 and was sold across Europe, becoming the first mainstream model of Opel to carry the name of Ascona. Opel Ascona was definitely a huge success. Three generations of Opel Ascona were built from 1970 to 1988 amounting to 3.9 million vehicles produced. Above all, Opel Ascona offered to families a lot of space for a reasonable price, reliability, modern technology and a fashionable design keeping up with the times. The first model of Opel Ascona became quickly a succes due to its size. The car was positioned between Opel Kadett and Opel Rekord. From the beginning, Opel successfully bet on diversity elements proposed by this new model; for example, the sedan was available with two and four doors, and the engines were from 60 to 90 HP, caming from Kadett and Rekord models. However, Opel Ascona was not just a hassle-free family car: Opel had already achiev various successes in motorsport driving this model. Walter Röhrl - nowadays Porsche ambassador - and Jochen Berger won in 1974 European Rally Champion using an Ascona A car type. 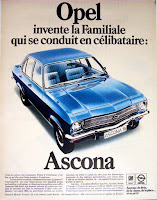 The success of Opel Ascona continued with the model Ascona B: its production took place from 1975 to 1981 and was a real best-seller accounting to 1.5 million vehicles sold, becoming the most successful model of Opel of any times. Opel Ascona B shared partially its basic structure and technical components with the model Opel Manta. But, it was its design that brought to the model a worldwide popularity: no curved shapes or excessive luxury but a limitation to a principal of functionality enriched by high-pitched colours, typical for the 1970s. The success of Opel Ascona continued with the version C, which was again sold more than 1.7 millions times. In motorsport, Opel was able to extend its success during the 1970s, allowing Walter Röhrl to win in 1982 the World Rally Championship drivers' title with Opel Ascona 400 with 144 PS. 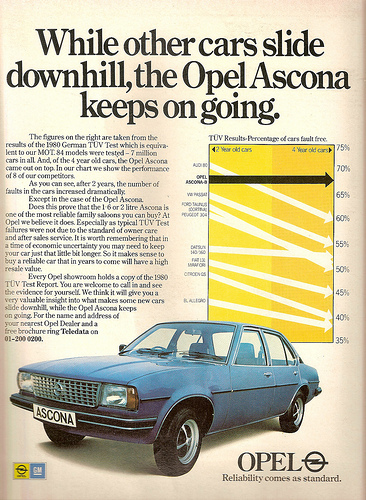 In Switzerland, Opel Ascona became a real success. As a matter of fact, the model Ascona Opel was widely used by the police forces and the Swiss army. Opel Ascona was usually given to warrant officers who were at least 37 years of age and to lieutenant-colonels, but colonels and brigadiers were entitled to have Opel Senator. Commanders of the division and major-generals were entitled to drive Mercedes 200, and their expenses for fuel, insurances and repairs were paid by the Swiss military administration. In 1988, Opel stopped the production of the model Ascona and transitioned to the model Vectra A. Nevertheless, the manufacturing of Opel Ascona continued till 1996 in Brazil. However, the mighty brand of Opel, which in the 1970's was second in terms of sales in Switzerland, lost extensively its market share finding itself behind the top ten brands. There are still enthusiasts wishing to have a beautiful long gone model of Opel Ascona. There are offers for used Opel Ascona cars that it is possible to buy in Switzerland. You can visit the Opel factories in Rüsselheim and Eisenach. Follow this link for registering.